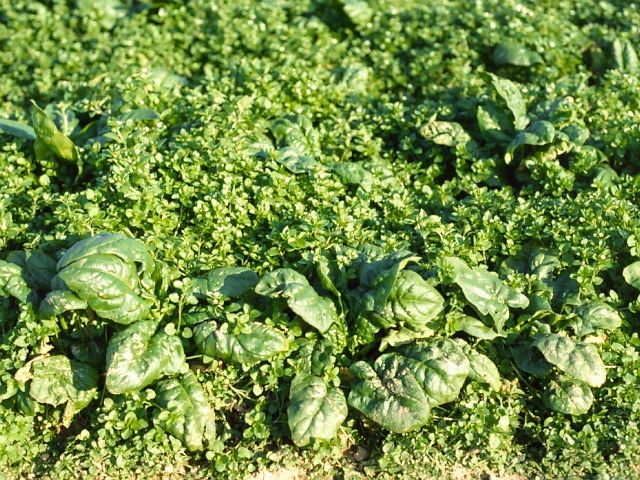 Overwintered spinach weed control requires the control of several troublesome winter annual weeds, including chickweed species, mustard species, henbit, and annual bluegrass. The only postemergence broadleaf herbicide currently recommended and available for use in spinach is Spin-Aid. The rate range for Spin-Aid is 3 to 6 pints per acre, for the control of seedling annual broadleaf weeds. The use rate depends on the expected daily high temperatures the week of treatment. Use 6 pints of Spin-Aid per acre when the daily highs are expected to be in the low 40’s (°F), 5 pints when the daily highs are expected to be in the low 50’s (°F), 4 pints when the daily highs are expected to be in the low 60’s (°F), and 3 pints when the daily highs are expected to be in the low 70’s (°F). Apply at sunset to reduce the risk of crop injury. Weed control results with Spin-Aid become more variable when weeds are well established and are beyond the seedling stage of growth. Heavily infested fields with well established or flowering winter annual broadleaf weeds may not be controllable, and may need to be abandoned. Spin-Aid will not control annual grasses such as annual bluegrass. Apply Select 2EC or Select Max in a separate spray application to control annual bluegrass. Use 8 fluid ounces of Select 2EC and add oil concentrate to be 1% of the spray solution, or 16 fluid ounces of Select Max and add nonionic surfactant to be 0.25% of the spray solution.